CHESTER — In 1729 two brothers, Abraham and Gideon Waterhouse, aged 29 and 16, moved to the wilderness later named Chester and within a few years built a grist mill. Of course they had no power machinery, yet that didn’t stop them from constructing a two-story wooden building, about 22 feet square, complete with a wooden waterwheel and other wooden machinery, plus two granite millstones weighing about a ton and a half each. And you think you work hard! Nathan Jacobson, a registered professional engineer who has spent most of his life living near the site of the old Waterhouse Grist Mill, spent several years researching the history of the old mill. 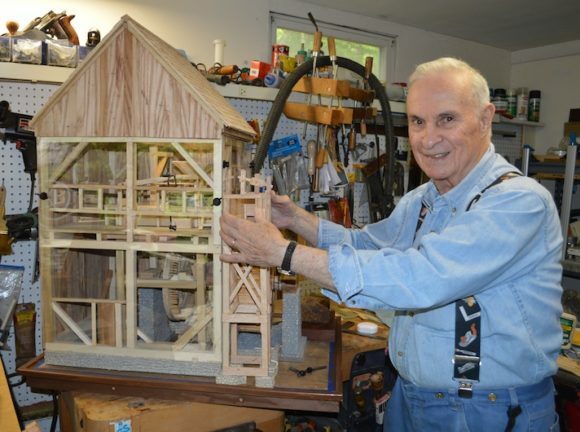 The Chester Historical Society recently published Jacobson ’s book, “The Waterhouse Grist Mill Saga.” Additionally, Jacobson created an intricate scale model of the grist mill for permanent exhibit at the Chester Museum at The Mill. On Sunday, Nov. 12, at 4 p.m., at the Chester Meeting House, Jacobson will demonstrate how the Waterhouse mill would have been constructed and how it worked. Through a Powerpoint program and the grist mill model, he will show how the Waterhouse brothers would have used the different parts of the machinery to grind the corn and grain for the early settlers. This is a free program sponsored by the Chester Historical Society and refreshments will be served. Jacobson ’s book will be available for purchase following the program. For more information, visit chesterhistoricalsociety.org or call 860-558-4701.